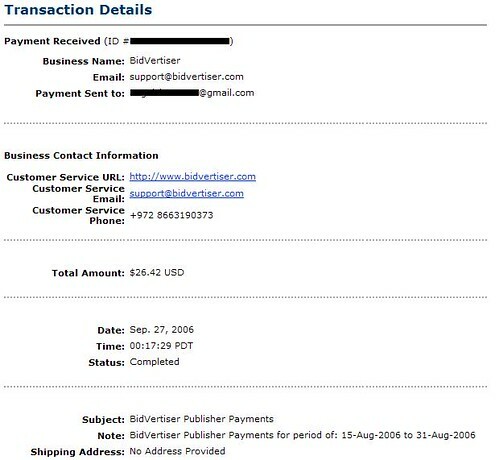 Yesterday finally I got the first payment to my Paypal account by Bidvertiser, it was about 26 dollars, earned from the ads in my other websites. I’m very happy about that, since it’s the first time I get so much money in my Paypal account! It also proved that Bidvertiser actually pays, at least for a small amount, although I don’t recommend it to anyone who has a very good website, because sometimes it won’t count some clicks. In spite of this it accepts almost all kinds of websites, including the free web sites and subdomains, you don’t need to wait for your website to be approved, but be careful that if your website is not approved after they review it some times later your website along with the earning from it will be DELETED!